The first full «Army Warfighting Assessment», AWA 17.1, kicked off at Fort Bliss, Texas on Monday, October 14, 2016. The two-week exercise is meant to gather feedback from Soldiers on the performance of new warfighting capabilities like robotics systems and autonomous weapons systems in a life-like combat situation, according to Major General Terry McKenrick, commander of the Army’s Brigade Modernization Command. «How well do these capabilities perform»? he said during a media day Friday, describing the questions the AWA is intended to answer. «Do they meet the requirements? Are the requirements right? Is there a way to make this capability better»? Participants in AWA 17.1 include Soldiers from the regular Army, Army National Guard, and Army Reserve, as well as soldiers from the United Kingdom, Australia, Canada, Denmark and Italy. During the AWA, Soldiers will implement 41 concepts and capabilities designed to meet 20 «warfighting challenges» posited by the Army. The exercise will be stopped three times so the Soldiers can provide insight on how the new capabilities helped or hindered the execution of their mission. McKenrick said the feedback will be analyzed by the Brigade Modernization Command. «We determine some findings and recommendations; we then brief that through a series of governance forms, and then it goes up to the Department of the Army, where senior leaders … can prioritize and make decisions», he said. In some cases, the new capabilities will be fielded to the Army; in others, improvements will be called for; and in still others, the capability will be judged ineffective or incapable of meeting the capability gap for which it was designed. Capabilities being assessed at AWA 17.1 include unmanned aerial systems, including the micro Unmanned Aircraft Systems (UAS), a «leader-follower» capability that is meant to increase the safety of convoy operations by limiting the number of drivers needed for vehicles. The Army defines the 20 «warfighting challenges» that new capabilities like the micro UAS are meant to answer as «enduring first-order problems, the solutions to which will improve the combat effectiveness of the current and future force». «We vet every concept and capability for Network Integration Evaluations and AWAs against those warfighting challenges, making sure we’re focused on solving the highest priority problems and gaps affecting our Army», McKenrick said. In the past, the Army conducted an array of the Network Integration Evaluations (NIEs), 11 in all, at a rate of two per year. Such evaluations are meant to determine how well equipment works within the existing Army network. That’s not the goal of the AWA, McKenrick said. Its purpose is to examine how new concepts and capabilities integrate into the war fight, rather than whether equipment works on the Army network. The AWA also brings in multi-national partners – because the Army doesn’t fight alone, McKenrick said. The AWA is meant to further develop interoperability in a joint, inter-organizational, and multinational environment – one of the 20 warfighting challenges. The AWA 17.1 is the first AWA, which is being held this year instead of an NIE. According to McKenrick, the Army will host one AWA and one NIE each year, in lieu of two NIEs a year. In July the Army will host NIE 17.2 at Fort Bliss. The Army already has plans for AWA 18.1 and NIE 18.2; as well as AWA 19.1 and NIE 19.2. On the occasion of the Euronaval Exhibition in Paris-Le Bourget, DCNS unveils BELH@RRA, the new front-line digital frigate dedicated to the international market and which renews the heavily-armed 4,000-tonne frigate segment. DCNS has named its new frigate BELH@RRA in reference to Europe’s only giant wave: the Belharra. The first «a» transformed into an @ makes reference to the highly digital nature of the frigate proposed by DCNS. With the BELH@RRA frigate, DCNS intends to continue the success enjoyed by La Fayette-class frigates, a reference on the naval defence market with over twenty units sold to four navies around the world. 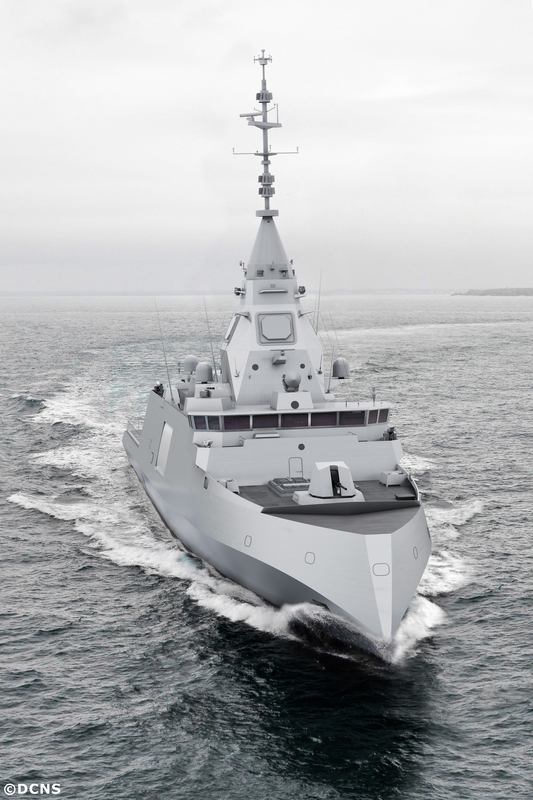 DCNS completes its product line by positioning a latest-generation vessel between the 6,000-tonne FREMM multi-mission frigate segment and that of the 2,500- to 3,000-tonne GOWIND corvettes. With the BELH@RRA frigate, DCNS responds to the expectations of navies looking for a compact frigate, capable of ensuring long-range missions, operating alone or embedded in a naval force, on the high seas or as part of coastal surveillance missions in a dense and hostile environment. The new BELH@RRA frigate offers operational intelligence that is unequalled on the market, in addition to a modular design, robustness and simplified use, which are all the fruit of the technological evolutions of the last few years. Ten years after the first design studies for the FREMM multi-mission frigate, DCNS’s latest frigate also capitalises on the experience of the French Navy with this vessel across a large number of operational theatres. Thanks to the architecture and versatility of DCNS’s SETIS combat-management system, proven on the FREMM frigates and GOWIND corvettes, the BELH@RRA frigate will respond to the specific needs of client navies in all areas of warfare, whilst at the same time offering significant platform modularity to increase vessel payload or autonomy. The new frigate will offer cutting-edge performance for submarine warfare, an unprecedented aircraft detection capability and strengthened air-surface warfare capacities; a multi-mission foundation to which capacities responding to new threats such as asymmetric warfare or cyber-defence will also be added. Resolutely oriented towards future operators in command of vessels beyond 2020, the BELH@RRA frigate benefits from digital technologies. These endow it with greater performance for data processing and threat detection whilst at the same time allowing the crew to concentrate on tasks with the most added value. The development of digital technologies guarantees the upgradeability of the vessel throughout its life-cycle. For a period of almost forty years, the equipment and systems will be incrementally modernised to adapt to evolutions in the operational context, future threats and the arrival of new technologies. DCNS already offers a French-Navy version of the new BELH@RRA frigate in the frame of the FTI (intermediate-size frigate) programme conducted by the French Procurement Agency (DGA) on behalf of the French Navy. For the French-Navy version, the BELH@RRA frigate is designed to satisfy France’s needs as defined by the French Ministry of Defence: a front-line frigate for anti-submarine warfare of a displacement of 4,000 tonnes equipped with widened self-defence and commando-projection capacities. Last but not least, it integrates the Thales Sea Fire four flat antenna radar and is equipped with ASTER 30 missiles from MBDA. 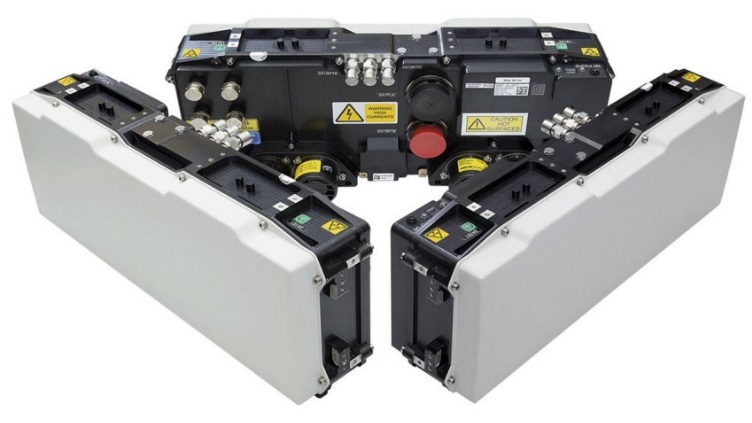 Leonardo-Finmeccanica’s Osprey Active Electronically Scanned Array (AESA) radar has been picked to serve as look-out on-board the US Navy’s newly-upgraded unmanned helicopter, the MQ-8C Fire Scout. The helicopter will be launched from the decks of U.S. naval combat vessels to keep watch for distant threats. The contract will see Leonardo delivering an initial batch of 5 radars to the U.S. Navy’s procurement organisation, the Naval Air Systems Command (NAVAIR), for testing and evaluation work. NAVAIR then has an option to buy a larger quantity of the radars for use in real operations. Leonardo has already built a number of Osprey AESA radars so the primary task under this contract is integration with the MQ-8C Fire Scout in time for first production deliveries. Leonardo is an international leader in radar technology and the Osprey was selected in part because it is the world’s first radar to provide the needed coverage without moving parts or the need for a bulky external radome, all in a package light enough to fit on an MQ-8C Fire Scout. The MQ-8C Fire Scout is expected in future to be fully integrated with both variants of the U.S. Navy’s littoral combat ship and be used extensively on operations. The U.S. Navy has chosen the 2-panel version of the Osprey which will provide a 240-degree instantaneous field of view and a range of digital modes including weather detection, air-to-air targeting and a Ground Moving Target Indicator (GMTI). The lack of moving parts inherent in the ‘E-Scan’ design means that repair and support costs are vastly reduced compared to alternative radar options. Osprey also provides an open architecture, meaning the U.S. Navy can insert new software independently. 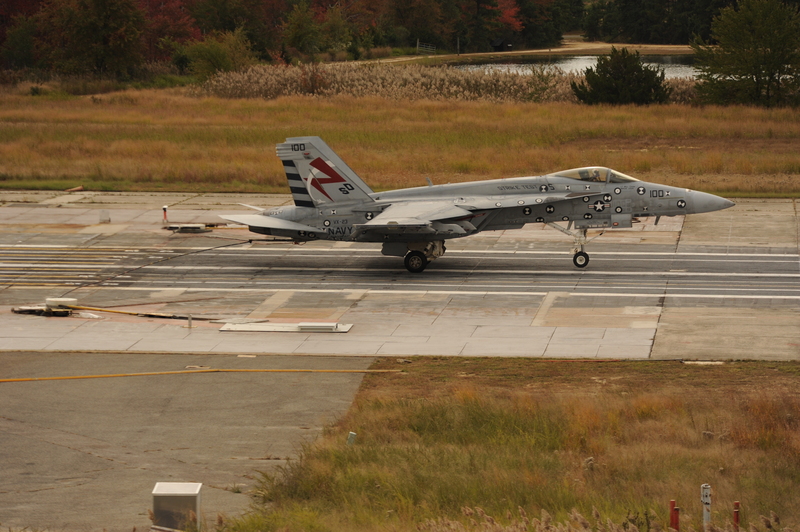 Advanced Arresting Gear (AAG) completes a first-of-its-kind recovery of an F/A-18E Super Hornet at the Runway Arrested Landing Site in Lakehurst, New Jersey, October 13. This event, conducted as part of AAG performance testing with the Super Hornet, follows more than 200 roll-in arrestments completed at the site since late March. 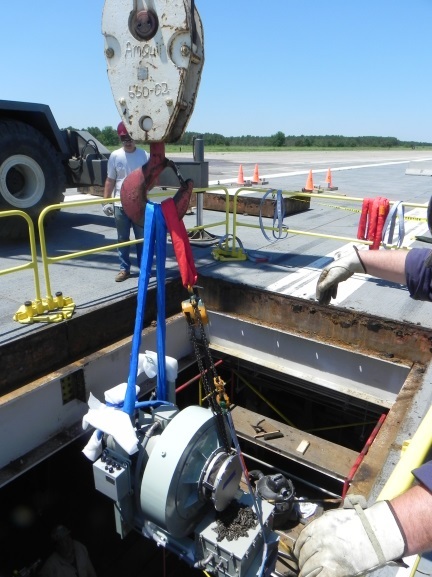 The AAG test team conducted more than 1,300 dead-load arrestments on the U.S. Navy’s newest aircraft recovery system before involving manned aircraft. «This milestone test event demonstrates AAG’s capability and signifies a big step forward in getting the system ready for duty on board the Navy’s newest aircraft carrier», said Aircraft Launch and Recovery Equipment (PMA-251) program manager Captain Stephen Tedford. 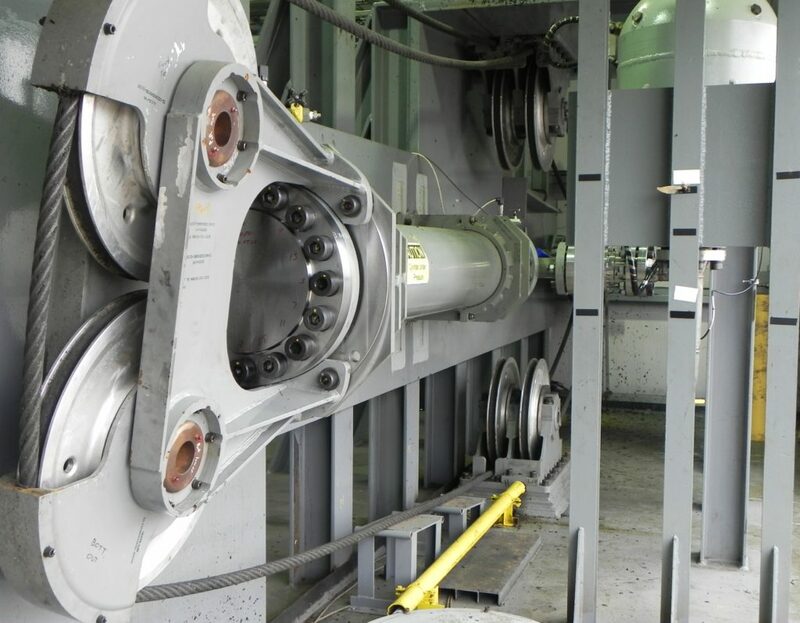 While roll-in and fly-in arrestments are essentially the same to the AAG system, conducting both types of traps enables the test team to ensure all operational conditions that the system will experience are tested. At the completion of AAG performance testing, an Aircraft Recovery Bulletin will be generated, allowing system testing with manned aircraft aboard Pre-Commissioning Unit (PCU) Gerald R. Ford (CVN-78) to progress. 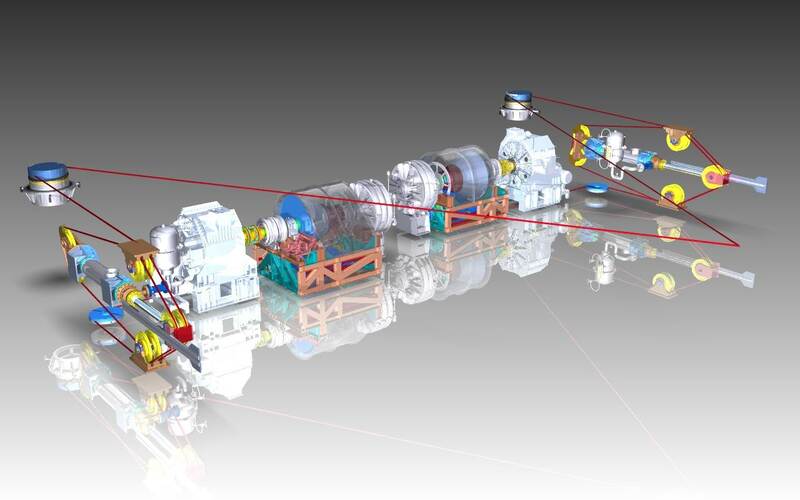 AAG is a modular, integrated system consisting of energy absorbers, power conditioning equipment and digital controls, designed as the follow-on to the Mark-7 (Mk-7) arresting gear. The U.S. Navy is currently utilizing the Mk-7 Mod 3 and Mk-7 Mod 4 designs on all Nimitz-class aircraft carriers. AAG is a new system developed for the Navy’s future aircraft carriers and will make its debut aboard the USS Gerald R. Ford (CVN-78). The AAG architecture, Health Monitoring Assessment and Prognostics technology, and digital control system provides built-in test and diagnosis, resulting in the system requiring less maintenance and manpower to operate than the Mk-7. This change in architecture is designed to provide higher reliability and safety margins, while allowing Sailors to focus on other areas of need. The system is also designed to allow potential arrestment of a broader range of aircraft, from the lightest unmanned aerial vehicles to the heaviest manned fighters. 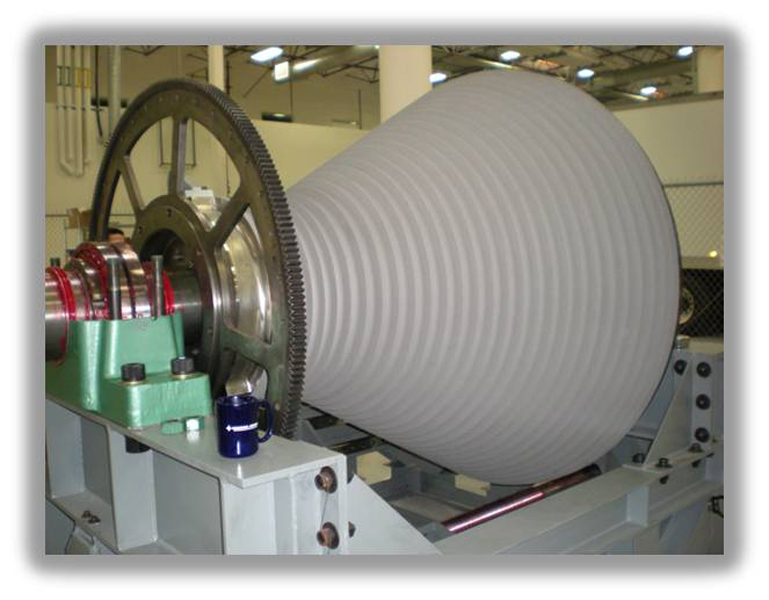 Allows for increased sortie rates, lower energy consumption and a decreased gross ship weight. 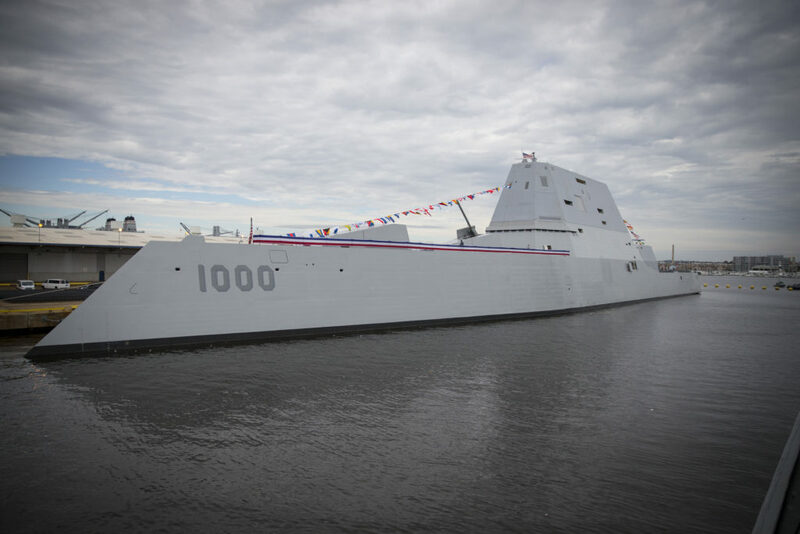 The U.S. Navy’s newest and most technologically advanced warship, USS Zumwalt (DDG-1000) was commissioned into active service Saturday, October 15, at North Locust Point in Baltimore. USS Zumwalt (DDG-1000), the lead ship of a class of next-generation multi-mission destroyers, features a state-of-the-art electric propulsion system, wave-piercing tumblehome hull, stealth design, and the latest warfighting technology and weaponry available. 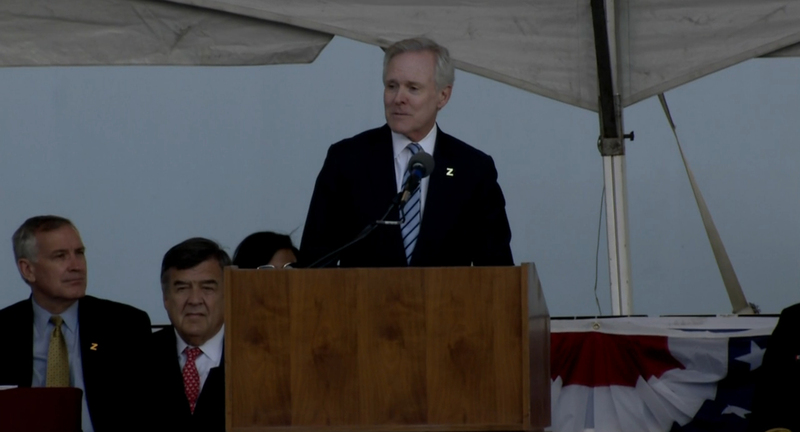 Secretary of the U.S. Navy, the Honorable Ray Mabus, delivered the ceremony’s principal address. «This ship is an example of a larger initiative to increase operational stability and give the U.S. a strategic advantage», said Mabus. «Our Navy and our Marine Corps, uniquely, provide presence – around the globe, around the clock – ensuring stability, reassuring allies, deterring adversaries, and providing the nation’s leaders with options in times of crisis». 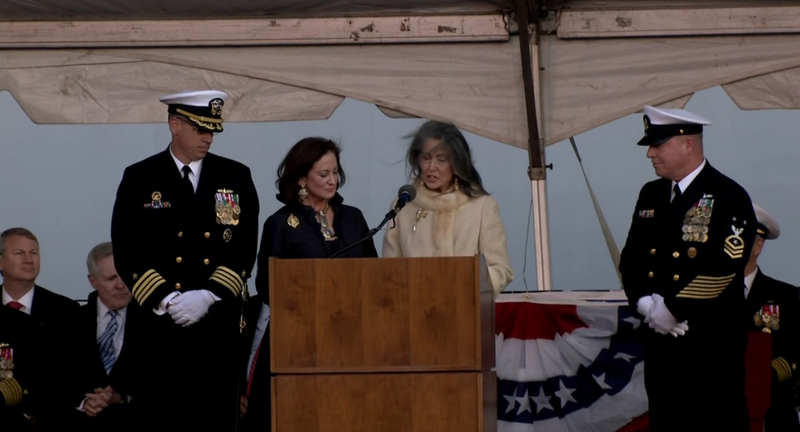 The ship’s co-sponsors, Ann Zumwalt and Mouzetta Zumwalt-Weathers, are daughters of former Chief of Naval Operations Admiral Elmo R. Zumwalt, Jr., after whom the ship is named. The sisters were an integral part of the ceremony, giving the order to «man our ship and bring her to life», in keeping with naval tradition. The Zumwalt-class destroyer will be capable of performing a range of deterrence, power projection, sea control, and command and control missions while allowing the U.S. Navy to evolve with new systems and missions. It does all of this while maintaining its stealth – making this visually imposing ship difficult to find whether close to the shore or far out to sea. «Today’s ceremony marked the culmination of over three years of dedication and hard work by some of the finest Sailors I have had the pleasure to lead», said Captain James A. Kirk, commanding officer of Zumwalt. «The only thing more impressive than the capabilities of the ship are the capabilities of its fine crew». Zumwalt will challenge adversaries and their way of thinking about how we employ our forces, providing an asymmetric advantage. Working with Arleigh Burke-class destroyers, littoral combat ships, and amphibious ships to form adaptive force packages, Zumwalt-class destroyers will use its computing capabilities to make these groups more lethal through increased range, deception, computer integration, and data analysis from various platforms. With its stealth, size, power, and advanced combat systems, this warship will serve as a centerpiece for deterrence and stability in the maritime environment. «This destroyer, like the others in our fleet, is capable of projecting power, no doubt», said Mabus. «The Zumwalt-class is much larger than today’s destroyers with a considerably larger flight deck – enough space to operate host Joint Strike Fighters, MV-22 Ospreys, and unmanned systems and a Vertical Launch System second to none». In addition to its size, the Zumwalt class will be the first Navy warships to utilize an integrated power system that will produce enough power to run current systems, as well as the power required for future weapons, computing, and sensor systems. USS Zumwalt (DDG-1000) generates approximately 78 megawatts of power, almost as much as a nuclear-powered aircraft carrier. This means the ship can operate all of its systems and still generate enough electricity to power a small town, which provides the extra capacity to accommodate future weapons and computing systems. Combined with its size and power, USS Zumwalt (DDG-1000) will be able to integrate emerging technologies and new capabilities as they are delivered to the fleet. USS Zumwalt (DDG-1000) embodies the legacy of warfighting excellence and innovation of Admiral Elmo R. Zumwalt, Jr., a veteran of World War II and the conflicts in Korea and Vietnam. He exemplified honor, courage and commitment during 32 years of dedicated naval service. Believing it was his job to «modernize and humanize» the U.S. Navy, Zumwalt chose to embrace change and to lead it from within. «I witnessed as he [Zumwalt] transformed our Navy, one Z-gram at a time… removing demeaning and abrasive regulations and moving to eliminate the scourge of racism and sexism from within our Navy», said Mabus. «Among many initiatives, he opened flight training to women and increased recruiting of under-represented Americans. And, as has always been the case when we open opportunities in our Navy and Marine Corps, we got stronger». As the nineteenth Chief of Naval Operations, Zumwalt embrace of innovation resulted in a number of successful new programs, including the Oliver Hazard Perry-class frigate, the Ohio-class ballistic missile submarine and the F-14 Tomcat, all of which had lasting impacts on the warfighting readiness of the U.S. Navy. Chief of Naval Operations (CNO) Admiral John Richardson, also spoke at the ceremony, commenting on the significance of the ship’s namesake. 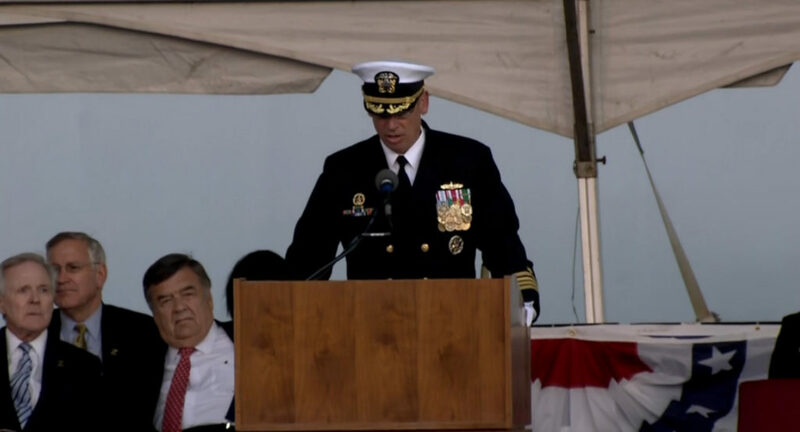 «Admiral Zumwalt, especially during his time as CNO, ensured that our institution lived by its values», said Richardson. «He was the ‘The Sailor’s Admiral,’ looking at new ideas, acting to the limit of his authorities, and adjusting along the way to make his Navy ready for combat – but also with full cognizance of the impact on the Sailors that made up that Navy». Perhaps most importantly, Admiral Zumwalt was a social reformer who recognized the primary force-multiplier of the U.S. Navy continued to be its Sailors, and as such began quality of life improvements throughout the Fleet. He was considered a «thinking officer» who was devoted to Sailors and creating an environment where everyone was treated equally – a legacy that can that can be seen today in the diversity of the fleet. His «one Navy» mentality reminds today’s Sailors that taking care of our warfighters ensures the Navy remains tough, bold and ready. «To say the Navy was transformed by Admiral Zumwalt is an understatement. Indeed, every leader on this stage and the great crew standing before us has benefited from Bud Zuwalt’s passion to make the Navy even better», said Vice Admiral Tom Rowden, commander, Naval Surface Forces during the ceremony. «So today we welcome this revolutionary warship to the fleet. A ship that demonstrates daring design and cutting-edge capability». «On behalf of the U.S. Naval Surface Force, I proudly accept ownership of the Navy’s newest ship to the fleet», Rowden said. USS Zumwalt (DDG-1000) is scheduled to begin her transit to San Diego (California), making several port visits along the way. 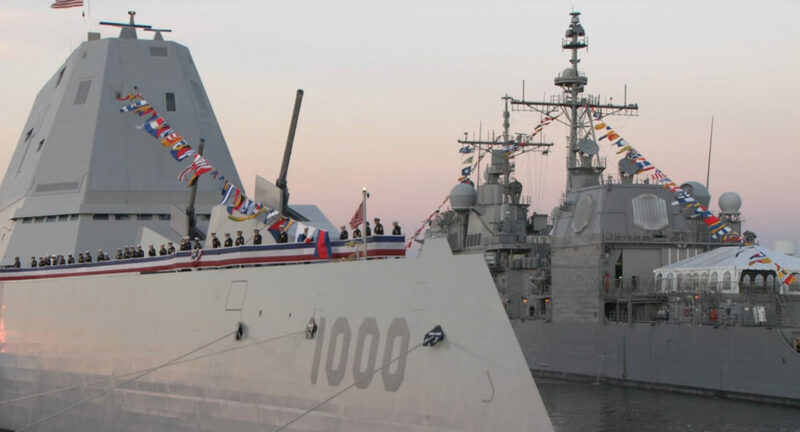 Upon arrival in San Diego, USS Zumwalt (DDG-1000) will begin installation of her combat systems, testing and evaluation, and operational integration with the fleet. Once fully integrated, Zumwalt’s stealth, power and lethality will provide a vital link from the Navy’s current needs to its future capabilities. A wave-piercing «Tumblehome» hull form. On October 14, TAURUS Systems GmbH, a joint venture of MBDA Deutschland GmbH (67 %) and SAAB Dynamics AB (33 %), handed over the first lot of TAURUS KEPD 350K stand-off missiles to the Republic of Korea Air Force (RoKAF). The ceremony, which saw the participation of representatives from the Defense Acquisition Program Administration (DAPA) and the RoKAF, was performed at the headquarters of TAURUS Systems GmbH in Schrobenhausen, Bavaria, and marked the start of series deliveries. 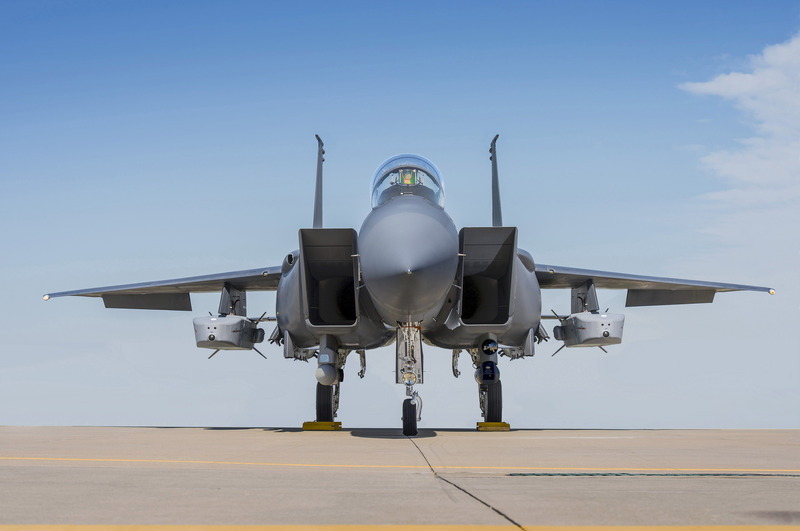 The TAURUS KEPD 350K programme is progressing according to plan and the integration to the Korean Air Force F-15K Strike Eagle fighter aircraft is in the final stages. TAURUS KEPD 350K weapon system will provide RoKAF with the most advanced stand-off and deep strike capability currently available on the world market. 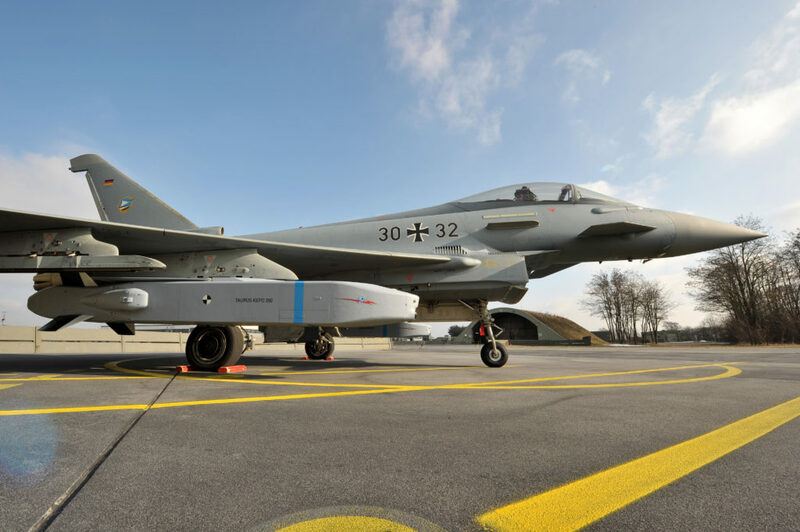 TAURUS KEPD 350K is an enhanced and upgraded version of the TAURUS KEPD 350 missile, which has been in service with the German Air Force since 2005 and with the Spanish Air Force since 2009. The TAURUS KEPD 350K is a modular stand-off missile system for precision strikes. The KEPD 350K missile has been designed and developed to fly through dense air defenses at a very low terrain-following level and for the engagement of high-value targets. The missile contains a highly effective dual stage warhead system, which combines excellent penetration capabilities for hard and deeply buried targets with blast-and-fragmentation capabilities against point and area targets. 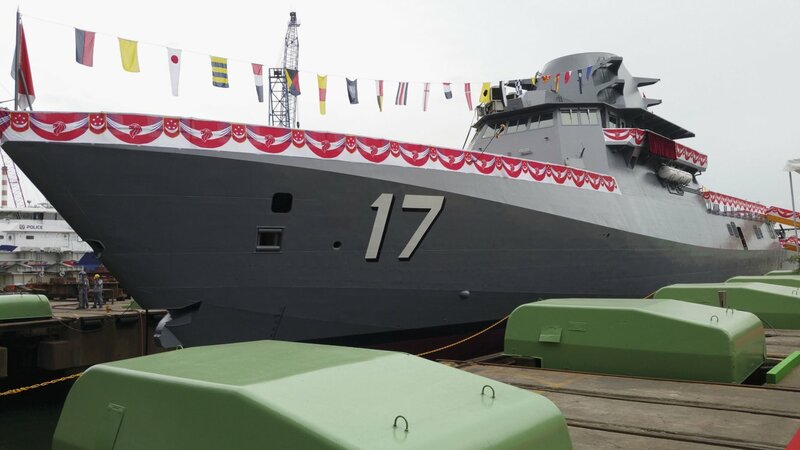 Singapore Technologies Marine Ltd (ST Marine), the marine arm of Singapore Technologies Engineering Ltd (ST Engineering), successfully launched the third Littoral Mission Vessel (LMV), Unity, designed and built for the Republic of Singapore Navy (RSN). The ceremony was officiated by Mr. Ong Ye Kung, Acting Minister for Education (Higher Education and Skills) and Senior Minister of State for Defence. 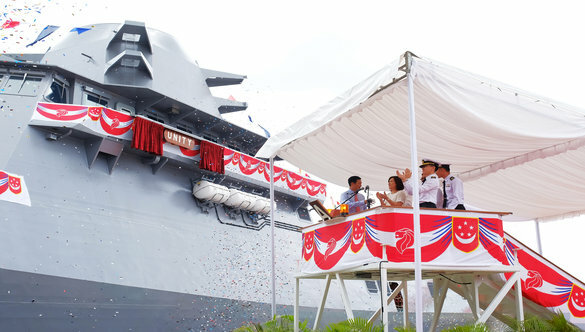 Mrs. Diana Ong, spouse of Mr. Ong, took on the role as the lady sponsor in accordance with naval traditions to name and launch the vessel at ST Marine’s Benoi Yard. The event was witnessed by many senior officials from Ministry of Defence (MINDEF) and the Singapore Armed Forces. «The launch of the third Littoral Mission Vessel – Unity is yet another gratified moment for ST Marine», said Ng Sing Chan, President for ST Marine. «We are making great strides in the LMV programme, made possible only with the hard-work and commitment from the project teams from MINDEF, RSN, DSTA and our many other partners. We are honoured to be given the opportunity to prime this contract and showcase our engineering expertise and the ability to manage large scale engineering systems». ST Marine was awarded the contract by MINDEF in 2013 to design and build eight LMVs for the RSN. The vessels are expected to be delivered from 2016 and be fully operational by 2020. They will replace the PVs designed and built by ST Marine in the 1990s. The LMV programme is in serial production at ST Marine with eight ships under construction or in the pre-construction phase. The first LMV, Independence has returned to Tuas Naval Base on 26 May 2016 and is performing the Checkout, Integration and Testing (CIT) for weapon systems on-board. The second LMV, Sovereignty is preparing for sea trials while the third LMV, Unity will embark on harbour acceptance trials after her launch. Smarter, faster and sharper, the LMVs are highly capable warships designed and equipped with advanced combat capabilities and technologies to further strengthen the RSN’s ability in protecting our sea lines of communication. With an innovative design and vast array of sense-making and decision support systems, the LMVs can operate smarter with a leaner crew for greater effectiveness and efficiency. The 262.5-foot/80-meter long vessels are 2.5 times larger in size and can travel faster than the current Fearless-class Patrol Vessels (PVs). They are highly manoeuvrable and can operate in confined and congested littoral waters effectively. Equipped with sharper and advanced combat capabilities and technologies, the LMVs can be quickly configured with mission modules to take on a wide spectrum of operations, allowing the crew to deliver calibrated responses using lethal and non-lethal options to deal with a range of maritime threats. The first seven joint light tactical vehicles were turned over to the Army and Marine Corps in late September by Oshkosh Defense for testing at different sites around the force. A total of about 100 of the Joint Light Tactical Vehicle (JLTV) «production vehicles» will be provided to the Army and Marine Corps for testing over the next year, at a rate of about 10 per month, officials said. The vehicles will undergo maneuverability and automotive testing at Yuma Proving Ground, Arizona, and other sites around the country. 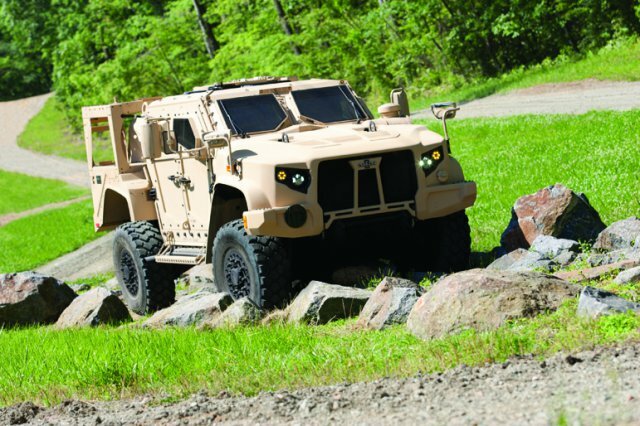 The JLTV is a tactical wheeled vehicle with a chassis that offers protection from underbelly blasts and an «intelligent» suspension system that can be raised and lowered for off-road conditions. It also touts greater fuel efficiency than current tactical vehicles. 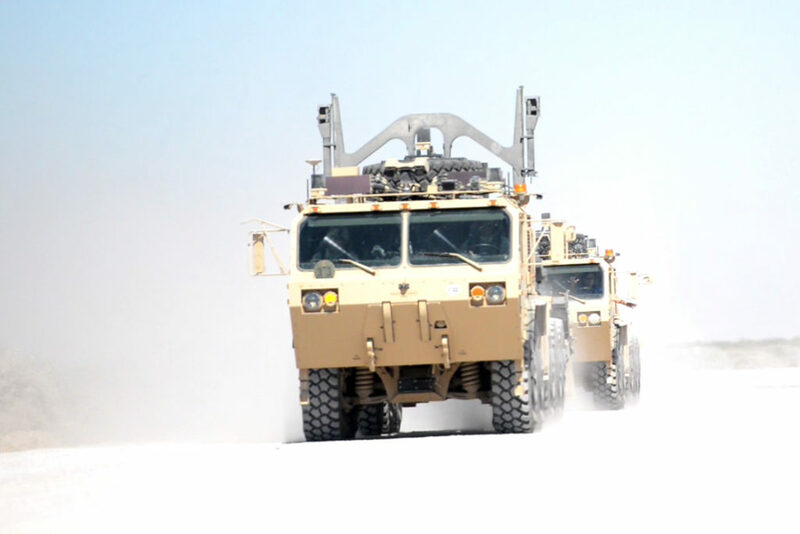 In addition to testing at Yuma, the vehicles will undergo testing for cyber integration of command, control, communications and intelligence at the Electronics Proving Ground on Fort Huachuca, Arizona. The vehicles will also be tested for automotive performance at Aberdeen Proving Ground, Maryland and the Cold Regions Test Center on Fort Greely, Alaska. «It’s on schedule», said Scott Davis, program executive officer for combat support and combat service support, about the JLTV program. «It’s doing everything we ever expected it to. It’s just incredible». The JLTV has four different variants: a general-purpose truck, a close-combat weapons carrier, a heavy guns carrier, and a two-door utility pickup version. The group of trucks delivered last week included all but one of the variant types, the close-combat weapons carrier. That variant should be included in the next delivery in a few weeks, according to an Oshkosh spokesman. 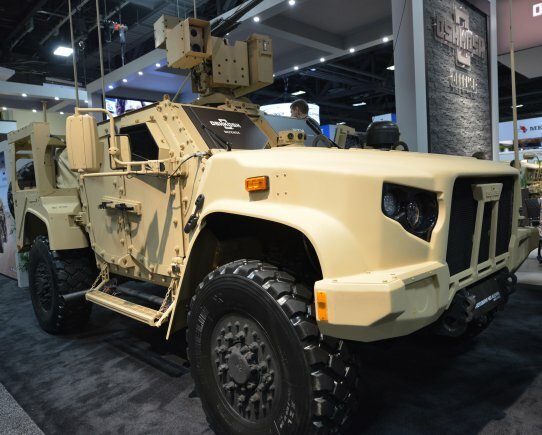 Colonel Shane Fullmer, project manager for the JLTV program, said the decision on the caliber of the weapons to be fielded on the variants will be made over the next few months. Once full production begins on the JLTV program in 2019, Army acquisition officials expect to shave five years off the original fielding schedule. The schedule reduction is expected to save $6 billion from previous estimates, Davis said. «Based on our original budget-planning figures for the vehicle, if it now comes in at a lower price, we’ll be able to buy more each year, which shrinks the total length of the contract», Davis said. «Of course, as you shorten things up, you accrue cost avoidances». Originally, plans for the program called for fielding all 54,599 vehicles for the Army and Marine Corps by the early 2040s. However, as a result of the unit cost savings, the Army should be able to buy more trucks faster. The Army may acquire the full complement by as early as the mid-2030s, officials said. Katrina McFarland, assistant secretary of the Army for Acquisition, Logistics and Technology, called the JLTV is «a marvelous construct» designed by brilliant engineers. The JLTV program has already been recognized as a model in acquisition, winning the Department of Defense’s prestigious David Packard Award for Acquisition Excellence twice – in 2013 and 2015. Just this past week, at the Association of the U.S. Army’s Annual Meeting and Exhibition, Army leaders honored the program with the 2015 Secretary of the Army’s Award for Environmental Excellence in Weapon System Acquisition. 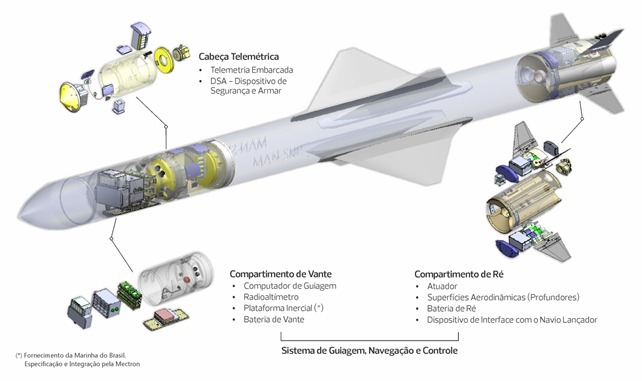 According to Indústria de Defesa & Segurança, the Brazilian Navy program to initiate the first National Anti-Ship Missile (Míssil Antinavio Nacional, MAN-SUP) developed with national technology is in the early prototype assembly phase. It’s confirmed by the Ezute Foundation, a company involved in the management of the program’s technical requirements. «The development of the MAN-SUP is a long term project that began in 2010. Today, we are starting the assembly of the first prototypes, and soon will begin their tests», explains Defense director of the foundation, Andrea Silva Hemerly. In addition to providing the Brazilian Navy with national anti-ship missiles that meet its operational requirements, the MAN-SUP Program aims to ensure Brazil’s dominance and technological autonomy throughout the life cycle of weapons of this class, from development to operation and maintenance, and in partnership with the national defense industry. The nationalization of weapons components has the support of Ezute Foundation – responsible for managing the technical requirements of the missile, the interface between all subsystems and validation activities of the project components – plus Avibras, Mectron, Omnisys and the Navy’s Technology Center in São Paulo. «Companies use Ezute’s management platform that provides an integrated view of the enterprise to the participants, and also provide areas reserved for each organization to support the management of their part of the program», says Andrea. 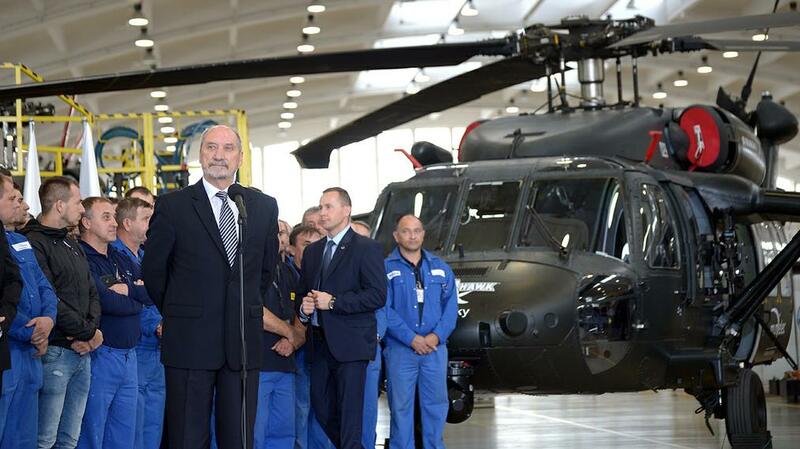 On Monday, October 10, 2016, Prime Minister Beata Szydło and Defence Minister Antoni Macierewicz participated in a meeting with the production crew of Polskie Zakłady Lotnicze Sp. z o.o. – PZL Mielec. The head of the Defence Ministry also met with the management of PZL Mielec and visited the Aircraft Study and Testing Center (Pol. : Centrum Badań i Prób Statków Powietrznych). «Later this week talks will begin, which will be concluded this year. (…) This year, the first helicopters will be delivered, allowing for exercises by our special forces to occur. This shows what potential Poland has, and what potential Mielec has», said the Defence Minister during a meeting with the employees of PZL Mielec. Earlier in the day, Prime Minister Beata Szydło and the Secretary of State in the Defence Ministry Bartosz Kownacki visited PZL Świdnik (Pol. : Wytwórnia Sprzętu Komunikacyjnego PZL – Świdnik S.A.). During the visit, the Prime Minister and the Deputy Minister met with the plant crew. During her visit on Monday in Świdnik, Prime Minister Beata Szydło recalled that «The Program of Responsible Development» (Pol. : «Program na Rzecz Odpowiedzialnego Rozwoju») focuses on the reindustrialization and development of modern innovative technologies based on indigenous potential. «We want to rebuild Polish industry and give it a chance. We want it to become the «flywheel of development» in Poland and for Polish companies to have a chance to compete with the best in the world. This is the ambition of our Government», said the Prime Minister. «The basis for this industry is for it to be the supply source of the Polish Armed Forces», she added. «The Polish Government must defend the best interest of the Polish State, and thus understood, is the supply of good and modern weaponry for our Armed Forces», stressed Prime Minister Beata Szydło. As she later added, «The priority of the government is for Poland to have new firms and factories producing, good, world-renowned equipment, including equipment for the army (…)», summing up. «The interest of the security of the State requires that companies produce and service helicopters», said, in turn, the Deputy Minister of Defense Bartosz Kownacki, referring to the end of the offset talks regarding the Caracal helicopters. «Since the terms of the offset (…) have not been met, since they did not meet the security interests of the State, we could not sign this agreement», added Mr. Bartosz Kownacki. The Deputy Minister stressed that the negotiations could not continue indefinitely, because the needs of the armed forces require the providing of appropriate, modern helicopters in the earliest possible time frame.